MaineREN is a facilities-based Regional Optical Network (RON) servicing Maine’s Research & Education community. MaineREN was created by the University of Maine System to deliver the cyberinfrastructure necessary to participate in, and be considered for, high-technology research. As the National Science Foundation has made the ability to demonstrate appropriate levels of Cyberinfrastructure a requirment for funding, it is crucial in Maine’s ability to attract and retain this high-technology research that our institutions have access to the national and international R&E community though a facilities-based RON. This effort is similar to other regional networks throughout the United States. Below is a map of the MaineREN network and primary institutions serviced. Here is a listing of some of the institutions that are connected through MaineREN. 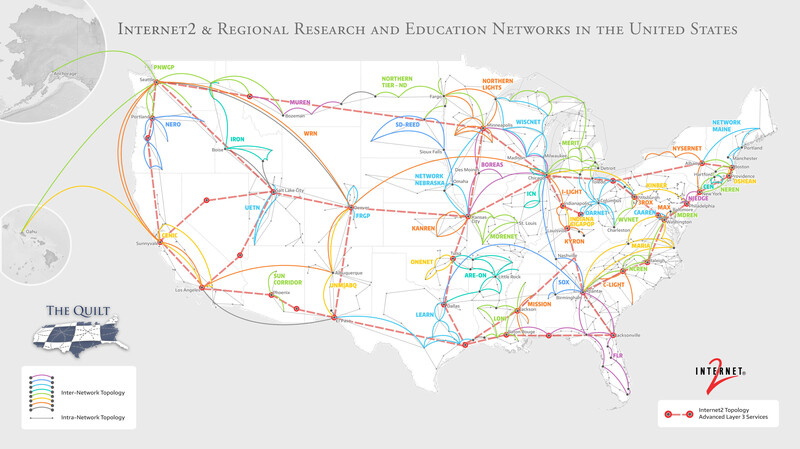 MaineREN is linked to the rest of Internet2® through Albany, NY and the Northern Crossroads GigaPOP in Cambridge, MA. with a current operational capacity of 20 Gbps dedicated to R&E connectivity. Networkmaine maintains a perfSONAR network performance testing server for MaineREN. a Java-based utility to test the path between you and MaineREN for throughput, latency, MTU, and TCP options for high performance applications. All tests are logged and publicly available here. MaineREN is a service of Networkmaine, a Unit of the University of Maine System.